LIVING ABROAD AND WANT TO STUDY IN THE NETHERLANDS? Thinking of going to a university or college in the Netherlands, but finding it difficult to choose? Or have you quit your current programme and are not sure what to do next? We can help you in finding which university or college and what programme suits you best. The variety and number of programmes on offer in the Netherlands can make the choice for the right university, college or programme difficult. And now that Dutch universities and colleges are increasingly tightening up their selection criteria, a well-founded, timely choice is essential. With some application dates as early as January, knowing what you want on time is key to ensuring you get into the university or college of your choice. 1. Getting to know you – It all starts with a free intake in which we discuss which questions you’d like to find an answer to and how we will proceed in doing so. Your parents are welcome to chip in. 2. Matching your interests – The intake is followed up by a number of one-on-one coaching sessions. You will also be required to do a short test regarding your interests, personal preferences and qualities. We then draw up a list of your personal choice of courses and programmes. 3. Finding the perfect match – The next step requires you to research programmes on your list and select the programmes that appeal to you the most. From there, you move on to finding out in even more detail about these programmes: what is the degree route and what are your future career prospects? 4. Making your choice – This step varies according to your needs. On average, students are able to make a motivated choice after 6 to 8 coaching sessions (that’s anything between 3 weeks to 3 months). But, if you need just that longer or require more coaching, we’re done only when you are! We use Skype for coaching and e-mail to keep in touch with you. At the end of the coaching sessions you’ll also know exactly what is required of you to be accepted at the college or university of your choice. And of course, we’ll also advise you on how best to apply for your programme, as well as inform you on practical matters regarding your move to the Netherlands and settling down in your new surroundings. We hope that, in this way, your time at university or college in the Netherlands gets off to a flying start! Contact Adine de Planque, Deirdre van Schaardenburg or Karin Kohnstamm to find out how we can help you. The coaching programme costs € 825.- (€ 998.25 incl. VAT). This is irrespective of the number of coaching sessions. The coaching programme is completed once a choice has been made. Payment in instalments is possible (please consult your coach regarding the possibilities). If fewer coaching sessions are required, an hourly rate will be applied: € 85.- per hour (€ 102.85 incl. VAT). 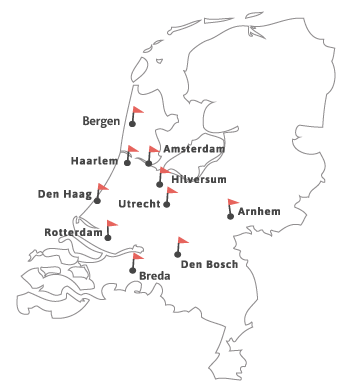 You can find us in Amsterdam, Arnhem, Bergen, Breda, Den Bosch, Den Haag, Haarlem, Hilversum, Rotterdam en Utrecht.